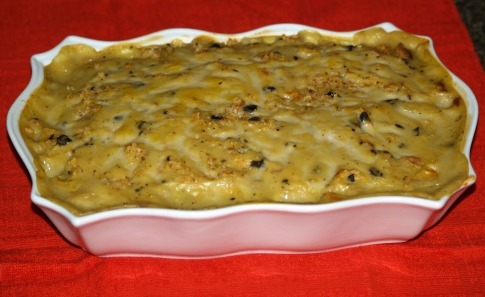 When you learn how to make chicken casseroles you will find them to be the favorite of one dish dinner. Chicken blends well with so many other ingredients, it is easy to combine it with a starch and vegetables to make a balanced meal. With spices you can make the dish anything from mild to extra spicy depending on what mood you are in. You may also choose to serve the chicken as whole pieces, in chunks or finely ground in these recipes when you learn how to make chicken casseroles. When you are asked to bring a covered dish to a church carry in, a pot luck dinner or a family get together, you cannot go wrong with a dish like this; chicken is always a favorite no matter what other ingredients are added. Most of these can be made ahead and put in the refrigerator for later baking; it helps a lot when you have a busy schedule. When I learned how to make chicken casseroles, I realized they can be a quick fix for any day of the week. If you do not have the right size pan called for in a recipe it is easy to substitute to another baking pan, baking dish or an iron skillet. Add your own touch of creativity by adding a simple topping or garnish. Leftovers from these recipes provide a great treat or lunch meal for another day. A plate of leftover is quick and easy to zap in the microwave. Cooked vegetables like broccoli and asparagus can be interchanged in many recipes. Place asparagus in buttered shallow baking dish. Arrange chicken slices over asparagus. Combine soup, cream, curry powder and Tabasco. Heat, stirring constantly until smooth. Add the pimento and pour over the asparagus and chicken. Top with cheese and paprika. Bake in preheated oven at 400 degrees for 15 minutes. Chicken recipes are some of our favorites. By changing the ingredients many different casseroles can be made with chicken. 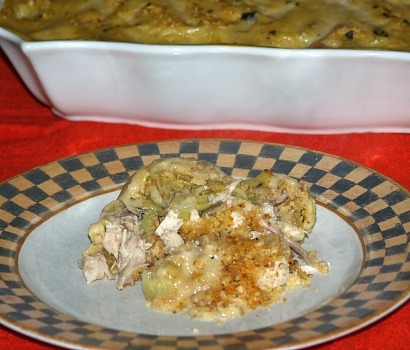 The first recipe is made by combining chicken with vegetables, cream sauce and cheese. The next recipe is a chicken stuffing dish. Others can be made with rice or noodles. Whatever you choose, most are very easy and usually turn out delicious. Cook the chicken until tender in a pot, covered with water. Add 2 stalks celery and 1 onion, 1/2 stick butter, salt & pepper. Save the broth for the dish. Debone the chicken when done. Melt remaining butter in 9 X 13 inch pan. Mix in 1/2 of the stuffing (save remainder for top).Spread the can of drained mushrooms over stuffing.. Arrange chicken on top. 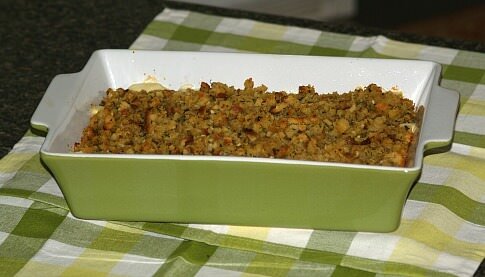 Then top with remaining stuffing mix. Mix soup with 1 1/2 cups of broth. Pour over the dish and bake at 350 degrees for 30 minutes. This is one of the recipes which is easy to put together with canned and packaged ingredients; sour cream makes it extra delicious. Cook noodles according to package; rinse and drain. Melt butter in covered skillet or saucepan and add chicken, tomato sauce, salt, pepper and garlic; cover and simmer 5 minutes. Fold together cooked noodles, sour cream, cottage cheese and onion. Spoon half of noodle mixture in bottom of greased baking dish; cover with half of chicken mixture. Layer remaining noodle mixture; layer remaining chicken mixture. Sprinkle Cheddar cheese over the top; bake for 30 minutes. This spinach recipe is a sample of adding vegetables to chicken recipes and coming up with a very good meal. Sauté minced garlic in 2 tablespoons butter; blend in 1 tablespoon flour and cook 1 minute. Add milk to hot mixture and boil 1 minute while stirring; stir in spinach. Spread mixture on bottom of buttered dish; cover with cooked chicken. Melt 3 tablespoons butter and add 3 tablespoons flour stirring to blend well. Stir in the cream and broth slowly while stirring to blend; season with salt and pepper. Simmer and stir until thick and creamy; pour mixture over the chicken. Sprinkle cheese over top of dish; bake for 20 minutes. 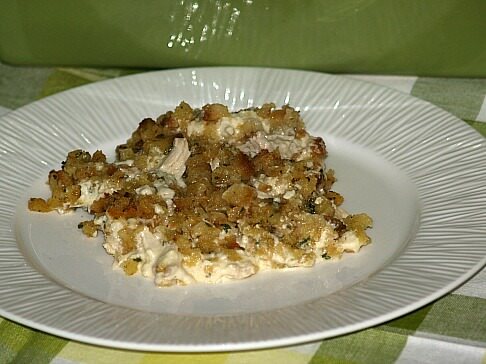 Combine and mix together chicken, celery soup, sour cream and onion; place in greased casserole baking dish. Combine dressing mix, hot water and butter; mix and spread over top of chicken mix. Cover and bake for 40 minutes; uncover and bake 15 additional minutes.